Bronzing Mist has a weightless application that results in a spectacular natural looking tan. Perfect and even instant colour dries in 60 seconds allowing you to mist it on any time. This self adjusting mist is oil free and complements your skin tone while your tan continues to deepen over three hours - all without the damaging effects of the sun. Aloe leaf juice and AHA (fruit acid) allows for the richest, longest lasting tan possible. 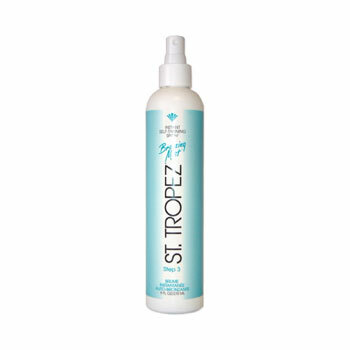 Like all St. Tropez products Bronzing mist has a pleasant fragrance and is ideal for your entire body, including your face. * Do not spray directly onto your face. * To prevent staining of household objects, avoid overspray. * Reapply to deepen or maintain colour as often as you like. * To ensure even fading moisturise every day and polish every days. This product does not contain sunscreens and does not protect against sunburn. Repeat exposure oif unprotected skin while tanning may increase the risk of skin ageing, skin cancer and other harmful effects to the skin even if you do not burn.